It still looks like we could see some thunderstorms later today. Although, I am not totally sold on severe weather around the area this afternoon/evening. At 11am, temperatures range from the upper 60's to middle 70's and dew points are in the lower 60's across southeast Missouri, southern Illinois, and western Kentucky. Here is a visible satellite image from 11:02am CT. The sun is trying to pop out in some areas. 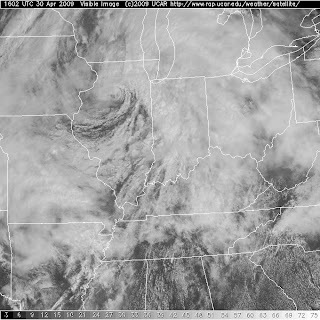 When you look at the satellite image, you can see the center of low pressure. Can you figure out where it is? We are going to see a mid-level disturbance move through the area later this afternoon and this evening. You can see it when looking at the 500mb level in the atmosphere. The first image is the initialization data for the NAM model valid at 12z (or 7am CT) this morning. The second image is for 0z Friday (or 7pm CT). You can see the vorticity maximum (aka vort max) in eastern Oklahoma in the first graphic. In the second graphic you can see how it moves over southeast Missouri. The vort max could be the spark for some thunderstorms later this afternoon/evening. The Storm Prediction Center (SPC) has the area in a "Slight Risk" of severe weather through 7am CT Friday. As a front is draped over the region, we will see daily chances for showers and thunderstorms over the next couple of days. There is also a daily chance of some stronger (if not severe) thunderstorms too. See the Day 2, Day 3, and Day 4 outlooks below from the SPC.